Information on how to enter the Countrywide Café of the Year 2019 Promotion (Promotion) and the prizes form part of these Terms and Conditions. By participating, Entrants (as defined below) agree to be bound by these Terms and Conditions. Entry is only open to Australian cafés. In this promotion, a ‘café’ is defined as being an establishment that serves coffee (both takeaway and eat-in) and other hot and cold beverages along with breakfast, lunch and other snack food items (Entrants), excluding cafés that are part of 50 or more outlets within a franchise group or chain, as well as pubs, clubs, RSLs, sporting clubs, service stations and roadhouses. Employees (and their immediate families) of Countrywide Australasia Limited (ABN: 34 068 162 676) of Level 1, 87 Marsden Street, Parramatta NSW 2150 (Promoter), Countrywide Food Service Distributors and agencies associated with this promotion are ineligible to enter. The Promoter may in its absolute discretion determine whether a café is eligible to participate in the Promotion (i.e. meets the definition of a café as determined by the Promoter). Tip Top Foodservice, McCain Foods, Primo Smallgoods Smallgoods and Anchor Food Professionals sponsor this Promotion but take no part in organising or conducting this Promotion, or allocating the Prizes. Entrants acknowledge that Countrywide Food Service Distributors is the Promoter and is a separate entity to these Supplier sponsors. The Promoter is not responsible for the acts or omissions of any sponsors of the Promotion. Entry commences at 9:00am AEDST on 11 February 2019 and entries close at 5:00pm AEDST on 5 April 2019 (Promotional Period). All times and dates throughout these Terms and Conditions are based on Sydney, Australia local time. Limit of one (1) entry per café location. Each café entry location must register separately and participate by itself (i.e. purchase the required goods and register and participate separately). Each registered café only represents itself and no other café locations. The café may only promote itself as part of the Promotion. Cafés that try to cross promote each other, which are discovered by the Promoter, will be invalidated. Only registered cafés are able to display promotional materials. If the café or any other third party has breached this requirement, as reasonably determined by the Promoter, then that café will be invalidated. No café may offer a prize, discount or any other inducement/benefit to gain votes. If the Promoter discovers this has occurred, then the Promoter may invalidate the café from the Promotion in its absolute discretion. All advertising used or obtained to promote the Entrant in the Promotion, must reference Countrywide Food Service Distributors in the main body copy of the advertising, or verbally announced if captured on video or audio media as reasonably determined by the Promoter in its absolute discretion. All individuals acknowledge and understand the Promotion does not include all Australian cafés. Accordingly, being a winner (national or regional) of the Promotion does not mean that a given café is indeed the best café (in all or a region) of Australia. Entrants must retain a copy of their original invoice as proof of purchase. Entrants must upon request provide a copy of their original invoice to the Promoter. Failure to present the proof of purchase upon request may result in the Entrants disqualification from the Promotion. All entries must be received by the Promoter during the Promotional Period. Entries received before the start of the Promotional Period or after the close of the Promotional Period will be deemed invalid and will not be eligible to win any prize. Records of the Promoter are final and conclusive as to time of receipt. Incomplete, illegible or indecipherable entries will be deemed invalid. The Promoter reserves the right, at any time, to verify the validity of entries and Entrants (including an Entrant’s identity, and place of residence and proof of purchase i.e. a copy of the receipt) and reserves the right, in its sole discretion, to disqualify any Entrant who the Promoter has reason to believe has breached any of these Terms and Conditions, tampered with the entry process or engaged in any unlawful or other improper misconduct calculated to jeopardise fair and proper conduct of the promotion. Errors and omissions may be accepted at the Promoter’s discretion. Failure by the Promoter to enforce any of its rights at any stage does not constitute a waiver of those rights. The Promoter’s legal rights to recover damages or other compensation from such an offender are reserved. The voting period commences 9:00am AEST, 8 April 2019 and ends 5:00pm AEST on 8 May 2019 (Voting Period). The first 100 participating Entrants to receive 100 votes will each receive the minor prize of a Countrywide voucher to the value of $100, that they can spend on their account with their Countrywide distributor. The Promoter accepts no responsibility for, late, lost, expired vouchers or vouchers that have been tampered with in anyway. The redemption of the vouchers are subject to standard terms and conditions. As part of the Promotion, the Promoter will conduct the social media post of the week component which will be called ‘Café of the Week’. To enter this component the Entrant must take a photo, video or GIF of how they are creatively promoting the Promotion within their café. The Entrant must then upload the post to their Business Facebook or Instagram account with the tag @cwcaféoftheyear and hashtag #cwcaféoftheyear so that it can be accessed by the Promoter during a round as setout below. There will be four (4) rounds in this component of the Promotion. Round 1 starts at 9am AEST on 8 April 2019 and ends 11.59pm AEST on 14 April 2019. Round 2 starts 12.01am AEST on 15 April 2019 and ends at 11.59pm AEST on 21 April 2019. Round 3 starts at 12.01am AEST on 22 April 2019 and ends at 11.59pm AEST on 28 April 2019. Round 4 starts 12.01am AEST 29 April 2019 and ends 5.00pm AEST on 8 May 2019. The most creative social media post in each round, as determined by the absolute discretion of the judges (wherein no further correspondence will be entered into), will each win the prize of a Countrywide voucher to the value of $250, that they can spend on their account with their Countrywide distributor. The Promoter accepts no responsibility for, late, lost, expired vouchers or vouchers that have been tampered with in anyway. The redemption of the vouchers are subject to standard terms and conditions. Once an Entrant wins a prize in this component of the Promotion they will not be eligible to win another prize in this component of the Promotion. There will be one (1) major prize awarded in the Promotion of $25,000 to the Entrant that receives the most votes overall in Australia during the Voting Period, subject to any limitations as set out in these Terms and Conditions. Once the major prize winner has been determined, there will be five (5) regional prize winners of $5,000 awarded to the Entrants that receive the most votes in each region (excluding the major prize winner). The regions are as follows: NSW/ACT; VIC/TAS; SA/NT; WA & QLD. For clarity, the major prize winner will not be eligible for a regional prize. If Entrants are jointly owned by one head company, then those Entrants (owned by the same head company) are only eligible to receive either one (1) national prize or one (1) regional prize in total. In addition, once one (1) Entrant (from within those group of Entrants that are jointly owned) wins a national or regional prize no other Entrants (from within those group of Entrants) are eligible to receive a regional or national prize. If there is tie between two or more Entrants for a prize, each of those tied individuals will be sent a tie-breaker question of why they deserve the prize, with the Entrant that sends the best answer in the required time in 25 words or less (based on literary and creative merit) awarded the prize. The major and regional prizes will paid out by way of a payment to the winning Entrants’ business bank account. The winners of the minor prizes will be notified in writing by email. All Countrywide vouchers will be mailed out to the winning recipient by the Countrywide Food Service Distributors head office. The major prize winner and region prize winners will be published online at www.cwcaféoftheyear.com.au; www.countrywide.net.au; and as well as on Countrywide Café of the Year Facebook and Instagram accounts @cwcaféoftheyear on 15 May 2019 at 10.00AM AEST. The total prize pool is $61,000. The Promoter’s decision in all matters relating to this Promotion is final and no correspondence will be entered into. If a prize (or an element of a prize) is unavailable, the Promoter, in its discretion, reserves the right to substitute the Prize (or that element of the prize) with another prize of equal value and/or specification, subject to any written directions from a regulatory authority. If for any reason a winner does not use, redeem or take a prize (or an element of a prize) by or at the time stipulated by the Promoter, then the prize (or that element of the prize) will be forfeited and will not be redeemable for cash. Entrants who win a prize consent to the Promoter using their name, likeness, image and/or voice (including photograph, film and/or recording of the same), in any media, for an unlimited period and without remuneration, for the purpose of promoting this Promotion (including any outcome), and promoting any products manufactured, distributed and/or supplied by the Promoter. If this Promotion is interfered with in any way or is not capable of being conducted as reasonably anticipated due to any reason beyond the reasonable control of the Promoter (including but not limited to technical difficulties, unauthorised intervention or fraud), the Promoter reserves the right, in its sole discretion, to the fullest extent permitted by law: (a) to disqualify any Entrant; or (b) to modify, suspend, terminate or cancel the Promotion, as appropriate. Any cost associated with entering the Promotion, or accessing the promotional website is the Entrant’s responsibility and is dependent on the Internet service provider used. Nothing in these Terms and Conditions limits, excludes or modifies or purports to limit, exclude or modify the statutory consumer guarantees as provided under the Competition and Consumer Act, as well as any other implied warranties under the ASIC Act or similar consumer protection laws in the States and Territories of Australia (Non-Excludable Guarantees). Except for any liability that cannot by law be excluded, including the Non-Excludable Guarantees, the Promoter (including its respective officers, employees and agents) exclude all liability (including negligence), for any personal injury; or any loss or damage (including loss of opportunity); whether direct, indirect, special or consequential, arising in any way out of the Promotion. Except for any liability that cannot by law be excluded, including the Non-Excludable Guarantees, the Promoter (including its respective officers, employees and agents) is not responsible for and excludes all liability (including negligence), for any personal injury; or any loss or damage (including loss of opportunity); whether direct, indirect, special or consequential, arising in any way out of: (a) any technical difficulties or equipment malfunction (whether or not under the Promoter’s control); (b) any theft, unauthorised access or third party interference; (c) any entry or prize claim that is late, lost, altered, damaged or misdirected (whether or not after their receipt by the Promoter) due to any reason beyond the reasonable control of the Promoter; (d) any variation in Prize value to that stated in these Terms and Conditions; (e) any tax liability incurred by a winner or Entrant; or (f) use, redemption or taking of a prize. As a condition of accepting a prize, each prize winner must sign any legal documentation as and in the form required by the Promoter and/or prize suppliers in their absolute discretion, including but not limited to a legal release and indemnity form. The laws in force in New South Wales apply to this Promotion to the exclusion of any other law. Entrants submit to the jurisdiction of the courts of New South Wales. Information on how to enter the Countrywide Café of the Year Voting Promotion 2019 (Promotion) and the prizes form part of these Terms and Conditions. By participating, Entrants (as defined below) agree to be bound by these Terms and Conditions. Entry is only open to Australian residents (excluding residents of NT and SA) aged 16 years or over (Entrants). Employees (and their immediate families) of Countrywide Australasia Limited (ABN: 34 068 162 676) of Level 1, 87 Marsden Street, Parramatta NSW 2150 (Promoter), Countrywide Distributors and agencies associated with this promotion are ineligible to enter. The Promotion commences at 9:00am AEST on 8 April 2019 and entries close at 5:00pm AEST on 8 May 2019 (Promotional Period). in accordance with the directions submit a vote for their favourite café from those cafés listed on the website. By submitting a vote the Entrant will receive one (1) entry in the draw. Limit of one (1) vote (and accordingly one (1) entry) per Entrant with a valid email address. Votes from invalid email addresses will be null and void. Entrants can only enter in their own name and not on behalf of another individual. The Promoter reserves the right, at any time, to verify the validity of entries and Entrants (including an Entrant’s identity, age, place of residence and email address) and reserves the right, in its sole discretion, to disqualify any Entrant who the Promoter has reason to believe has breached any of these Terms and Conditions, tampered with the entry process or engaged in any unlawful or other improper misconduct calculated to jeopardise fair and proper conduct of the promotion. Any Entrant in breach may be denied entry to any future promotions held by the Promoter. Errors and omissions may be accepted at the Promoter’s discretion. Failure by the Promoter to enforce any of its rights at any stage does not constitute a waiver of those rights. The Promoter’s legal rights to recover damages or other compensation from such an offender are reserved. There will be twenty (20) prizes (Prizes) awarded in this Promotion. Five (5) Prizes awarded in each State Group draw (Draw). The entries will be divided into State Groups as follows: NSW/ACT, VIC/TAS, WA & QLD. Each Draw will take place at the Promoter’s office at 10am on 14 May 2019. The Promoter may draw additional reserve entries and record them (in the order in which they were drawn) in case an invalid entry or ineligible Entrant is drawn. The winners of the Prizes will be notified in writing by email within two (2) business days of the Draw, and their names will be published online at www.cwcaféoftheyear.com.au; www.countrywide.net.au; and as well as on Countrywide Café of the Year Facebook and Instagram accounts @cwcaféoftheyear on 15 May 2019. The first valid five (5) entries drawn, in each Draw, will win one (1) $500 Universal Gift Card Prepaid Visa. Standard terms and conditions of the card issuer apply to the use of the gift card including those specified below. The Promoter accepts no responsibility for lost, stolen, expired or gift cards that are damaged in anyway. The prepaid card is issued by Heritage Bank Limited ABN 32 087 652 024 AFSL/ACL 240984. Heritage Bank deals with any funds loaded onto the card in accordance with its arrangements with Universal Gift Card Pty Ltd ABN 25 092 828 772. The card must be activated by the date shown on the accompanying letter or it will be cancelled. To activate the card, the winner will need to visit www.universalgiftcard.com.au and enter the card number and four-digit authentication code. Once the card is activated, the funds will be available within one business day. The expiry date is shown on the front of the card. After its expiry, or cancellation for non-activation, any balance will be forfeited and the card will be declined when presented for use. No notice will be given of expiry or cancellation. A draw for any unclaimed Prize, may take place on 14 August 2019 at the same time and place as the original Draw, subject to any directions from a regulatory authority. 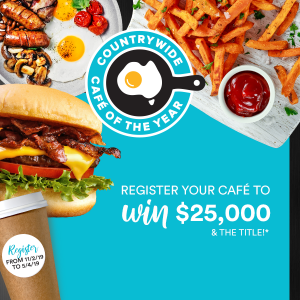 The winners (if any) will be notified by email within two (2) business days of the Draw, and their name will be published online at www.countrywide.net.au and www.cwcaféoftheyear.com.au on 21 August 2019. The total prize pool for each State Group is $2,500. If this Promotion is interfered with in any way or is not capable of being conducted as reasonably anticipated due to any reason beyond the reasonable control of the Promoter (including but not limited to technical difficulties, unauthorised intervention or fraud), the Promoter reserves the right, in its sole discretion, to the fullest extent permitted by law: (a) to disqualify any Entrant; or (b) subject to any written directions from a regulatory authority, to modify, suspend, terminate or cancel the Promotion, as appropriate. Except for any liability that cannot by law be excluded, including the NonExcludable Guarantees, the Promoter (including its respective officers, employees and agents) is not responsible for and excludes all liability (including negligence), for any personal injury; or any loss or damage (including loss of opportunity); whether direct, indirect, special or consequential, arising in any way out of: (a) any technical difficulties or equipment malfunction (whether or not under the Promoter’s control); (b) any theft, unauthorised access or third party interference; (c) any entry or Prize claim that is late, lost, altered, damaged or misdirected (whether or not after their receipt by the Promoter) due to any reason beyond the reasonable control of the Promoter; (d) any variation in Prize value to that stated in these Terms and Conditions; (e) any tax liability incurred by a winner or Entrant; or (f) use, redemption or taking of a Prize. As a condition of accepting a Prize, each Prize winner (or if under 18 years of age, their parent or guardian on their behalf), must sign any legal documentation as and in the form required by the Promoter and/or Prize suppliers in their absolute discretion, including but not limited to a legal release and indemnity form. Tip Top Foodservice, McCain Foods, Primo Smallgoods and Anchor Food Professionals sponsor this Promotion but take no part in organising or conducting this Promotion, or allocating the Prizes. Countrywide Food Service Distributors is the Promoter and is a separate entity to these Supplier sponsors. Information on how to enter the Countrywide Café of the Year Voting Promotion 2019 – SA/NT (Promotion) and the prizes form part of these Terms and Conditions. By participating, Entrants (as defined below) agree to be bound by these Terms and Conditions. Entry is only open to South Australian and Northern Territory residents aged 16 years or over (Entrants). 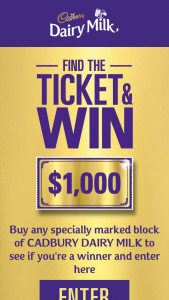 Employees (and their immediate families) of Countrywide Australasia Limited (ABN: 34 068 162 676) of Level 1, 87 Marsden Street, Parramatta NSW 2150 (Promoter), Countrywide Distributors and agencies associated with this promotion are ineligible to enter. There will be five (5) prizes (Prizes) awarded in this Promotion. The draw will take place at the Promoter’s office at 10am on 14 May 2019. The Promoter may draw additional reserve entries and record them (in the order in which they were drawn) in case an invalid entry or ineligible Entrant is drawn. The winners of the Prizes will be notified in writing by email within two (2) business days of the Draw, and their names will be published online at www.cwcaféoftheyear.com.au; www.countrywide.net.au; and as well as on Countrywide Café of the Year Facebook and Instagram accounts @cwcaféoftheyear on 15 May 2019. The first valid five (5) entries drawn will each win one (1) $500 Universal Gift Card Prepaid Visa. Standard terms and conditions of the card issuer apply to the use of the gift card including those specified below. The Promoter accepts no responsibility for lost, stolen, expired or gift cards that are damaged in anyway. The total prize pool is $2,500.